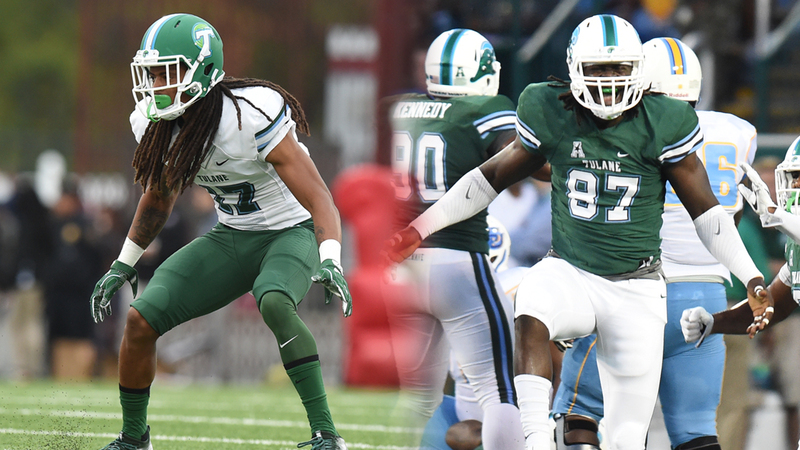 NEW ORLEANS – A pair of Tulane football seniors, defensive tackle Ade Aruna and cornerback Parry Nickerson, was named to the Reese’s Senior Bowl watch list prior to the start of the 2017 season. Aruna has garnered attention in the preseason, receiving third-team All-American Athletic Conference preseason honors from Athlon Sports and College Sports Madness. The Akure, Nigeria, native has played in 32 career games 23 starts at defensive end and recorded 82 tackles, 16 tackles for loss and nine sacks. Nickerson has received numerous preseason accolades as well coming into his final season wearing the Olive and Blue, being named to the watch lists for the Paycom Jim Thorpe Award and Wuerffel Trophy and named an Allstate American Football Coaches Association Good Team nominee. The second-team All-American Athletic Conference selection from a year ago has played in 36 games with 34 starts at cornerback, amassing 133 tackles, six tackles for loss, three forced fumbles, four fumble recoveries, one blocked kick, 10 interceptions and 23 pass breakups. The initial Resse’s Senior Bowl watch list includes more than 400 student athletes from nearly every level of college football. This watch list will be pared down throughout the season to determine the 110 players who will play for the North and South squads in the nation’s premier all-star game. The 2018 Reese’s Senior Bowl is slated for Saturday, Jan. 27 at Ladd-Peebles Stadium in Mobile, Ala. Follow Tulane football on Twitter, Facebook and @GreenWaveFB on Snapchat. Follow Tulane Athletics on Twitter, Facebook¬, Instagram and @TulaneAthletics on Snapchat.